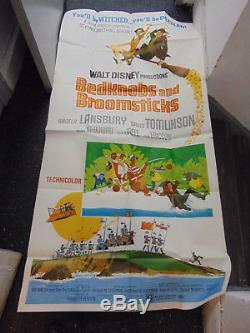 Rare original 3 sheet movie poster from Robert Stevenson's BEDKNOBS AND BROOMSTICKS starring Angela Lansbury and David Tomlinson. Folded, good condition- some small tears at sides. The item "BEDKNOBS AND BROOMSTICKS /ORIG. 3 SHEET MOVIE POSTER(ANGELA LANSBURY/WALT DISNEY)" is in sale since Thursday, February 22, 2018.